A fermented beverage of plant extracts was prepared from about fifty kinds of vegetables and fruits. Natural fermentation was carried out mainly by lactic acid bacteria (Leuconostoc spp.) and yeast (Zygosaccharomyces spp. and Pichia spp.). We have previously examined the preparation of novel four trisaccharides from the beverage: O-β-D-fructopyranosyl-(2->6)-O-β-D-glucopyranosyl-(1->3)-D-glucopyranose, O-β-D-fructopyranosyl-(2->6)-O-[β-D-glucopyranosyl-(1->3)]-D-glucopyranose, O-β-D-glucopyranosyl-(1->1)-O-β-D-fructofuranosyl-(2<->1)-α-D-glucopyranoside and O-β-D-galactopyranosyl-(1->1)-O-β-D-fructofuranosyl-(2<->1)- α-D-glucopyranoside. Three further novel oligosaccharides have been found from this beverage and isolated from the beverage using carbon-Celite column chromatography and preparative high performance liquid chromatography. Structural confirmation of the saccharides was provided by methylation analysis, MALDI-TOF-MS and NMR measurements. The following novel trisaccharides were identified: O-β-D-fructofuranosyl-(2->1)-O-[β-D-glucopyranosyl-(1->3)]-β-D-glucopyranoside (named "3G-β-D-glucopyranosyl β, β-isosucrose"), O-β-D-glucopyranosyl-(1->2)-O-[β-D-glucopyranosyl-(1->4)]-D-glucopyranose (41-β-D-glucopyranosyl sophorose) and O-β-D-fructofuranosyl-(2->6)-O-β-D-glucopyranosyl-(1->3)-D-glucopyranose (62-β-D-fructofuranosyl laminaribiose). A beverage was produced by fermentation of an extract from 50 kinds of fruits and vegetables (see Additional file 1) [1, 2]. The extract was obtained using sucrose-osmotic pressure in a cedar barrel for seven days and was fermented by lactic acid bacteria (Leuconostoc spp.) and yeast (Zygosaccharomyces spp. and Pichia spp.) for 180 days. The fermented beverage showed scavenging activity against 1,1'-diphenyl-2-picrylhydrazyl (DPPH) radicals, and significantly reduced the ethanol-induced damage of gastric mucosa in rats . Analysis by high performance anion exchange chromatography (HPAEC) showed that this beverage contained high levels of saccharides, estimated between 550 and 590 g/L; mainly glucose and fructose, and a small amount of undetermined oligosaccharides. Recently, it was reported that different positions of glycosidic linkage of oligosaccharide isomers affected physiological properties as well as physical properties [3–5]. Development of HPLC analysis with high sensitivity and separation ability enables the detection and isolation of oligosaccharides in the fermented beverage. 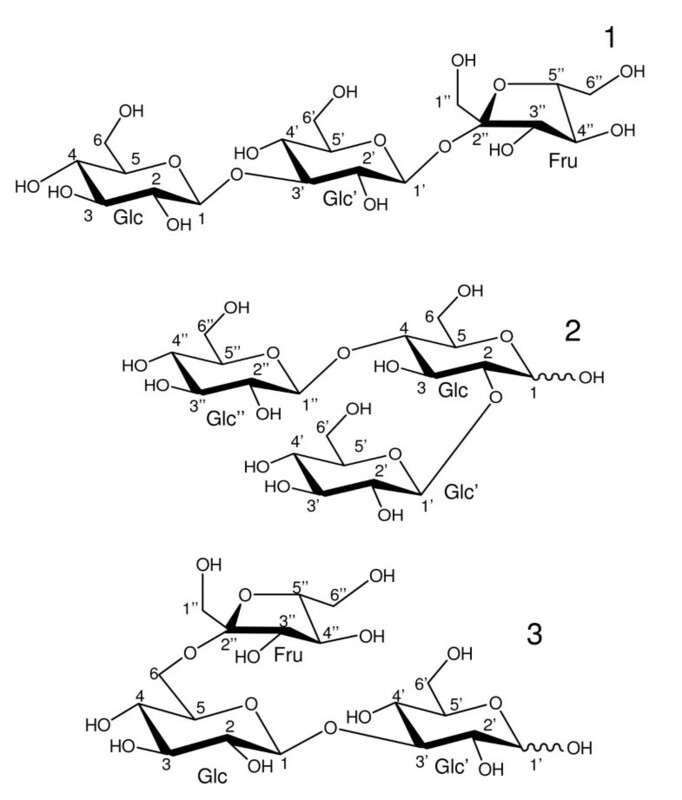 We have previously examined the preparation of saccharides of the fructopyranoside series from the fermented beverage of plant extracts, such as O-β-D-fructopyranosyl-(2->6)-D-glucopyranose , O-β-D-fructopyranosyl-(2->6)-O-β-D-glucopyranosyl-(1->3)-D-glucopyranose and O-β-D-fructopyranosyl-(2->6)-O-[β-D-glucopyranosyl-(1->3)]-D-glucopyranose . The characteristics of O-β-D-fructopyranosyl-(2->6)-D-glucopyranose were non-cariogenicity and low digestibility, and the unfavorable bacteria that produce mutagenic substances did not use the saccharide [7, 8]. Recently, we have studied isolation and identification of novel non-reducing trisaccharides, such as O-β-D-glucopyranosyl-(1->1)-O-β-D-fructofuranosyl-(2<->1)-α-D-glucopyranoside and O-β-D-galactopyranosyl-(1->1)-O-β-D-fructofuranosyl-(2<->1)- α-D-glucopyranoside from the beverage , and those saccharides were confirmed to be produced by fermentation. In this paper, we have confirmed structures of the novel trisaccharides (Fig. 1): O-β-D-fructofuranosyl-(2->1)-O-[β-D-glucopyranosyl-(1->3)]-β-D-glucopyranoside (named "3G-β-D-glucopyranosyl β, β-isosucrose"), O-β-D-glucopyranosyl-(1->2)-O-[β-D-glucopyranosyl-(1->4)]-D-glucopyranose (41-β-D-glucopyranosyl sophorose) and O-β-D-fructofuranosyl-(2->6)-O-β-D-glucopyranosyl-(1->3)-D-glucopyranose (62-β-D-fructofuranosyl laminaribiose), isolated from the fermented beverage using methylation analysis, MALDI-TOF-MS and NMR measurements. Structures of O -β-D-fructofuranosyl-(2->1)- O -[β-D-glucopyranosyl-(1->3)]-β-D-glucopyranoside (1), O -β-D-glucopyranosyl-(1->2)- O -[β-D-glucopyranosyl-(1->4)]-D-glucopyranose (2) and O -β-D-fructofuranosyl-(2->6)- O -β-D-glucopyranosyl-(1->3)-D-glucopyranose (3). Saccharides 1, 2 and 3 were isolated from the fermented beverage of plant extracts using carbon-Celite column chromatography, and were shown to be homogeneous using anion exchange HPLC [tR, sucrose (relative retention time; retention time of sucrose = 1.0): 1.89, 2.23 and 2.40 respectively]. The retention time of saccharides 1, 2 and 3 did not correspond to that of any authentic saccharides [glucose (0.62), fructose (0.68), sucrose (1.00), maltose (1.43), trehalose (0.58), laminaribiose (1.33), raffinose (1.23), 1-kestose (1.47), 6-kestose (1.75), neokestose (1.90), maltotriose (2.59), panose (1.87), nystose (2.06), fructosylnystose (3.81), O-β-D-fructopyranosyl-(2->6)-D-glucopyranose (0.83) , O-β-D-fructopyranosyl-(2->6)-O-β-D-glucopyranosyl-(1->3)-D-glucopyranose (1.74) , O-β-D-fructopyranosyl-(2->6)-O-[β-D-glucopyranosyl-(1->3)]-D-glucopyranose (1.72) , O-β-D-glucopyranosyl-(1->1)-O-β-D-fructofuranosyl-(2<->1)- α-D-glucopyranoside (1.24) , O-β-D-galactopyranosyl-(1->1)-O-β-D-fructofuranosyl-(2<->1)-α-D-glucopyranoside (0.84) , 2(2-α-D-glucopyranosyl)isokestose (1.57) , 2(2-α-D-glucopyranosyl)2isokestose (1.79) , 2(2-α-D-glucopyranosyl)3isokestose (2.09) , 2(2-α-D-glucopyranosyl)nystose (2.17) , 2(2-α-D-glucopyranosyl)2nystose (2.63) , O-α-D-glucopyranosyl-(1->2)-O-α-D-xylopyranosyl-(1->2)-β-D-fructofuranoside (1.51) , O-α-D-glucopyranosyl-(1->2)-O-α-D-glucopyranosyl-(1->2)-O-α-D-xylopyranosyl-(1->2)-β-D-fructofuranoside (1.80) . The degree of polymerization of saccharides 1, 2 and 3 was established as 3 by measurements of [M+Na] ions (m/z: 527) using TOF-MS (see Fig. 2), and analysis of the molar ratios of D-glucose to D-fructose in the acid hydrolysates. Acid hydrolysates of saccharides 1 and 3 were liberated to glucose and fructose, and saccharide 2 was liberated to glucose. From the GC analysis, relative retention times of the methanolysate of the permethylated saccharides were investigated [tR (relative retention time; retention time of methyl 2, 3, 4, 6-tetra-O-methyl-β-D-glucoside = 1.0; retention time, 9.60 min)]. The methanolysate of permethylated saccharide 1 exhibited six peaks (see Additional file 2) corresponding to methyl 2,3,4,6-tetra-O-methyl-D-glucoside (tR, 0.94 and 1.48), methyl 2,4,6-tri-O-methyl-D-glucoside (tR, 3.27 and 4.81) and methyl 1,3,4,6- tetra-O-methyl-D-fructoside (tR, 1.06 and 1.32). The methanolysate of permethylated saccharide 3 also exhibited six peaks (see Additional file 2) corresponding to methyl 2,3,4-tri-O-methyl-D-glucoside (tR, 2.58 and 3.59), methyl 2,4,6-tri-O-methyl-D-glucoside (tR, 3.22 and 4.73), and methyl 1,3,4,6-tetra-O-methyl-D-fructoside (tR, 1.07 and 1.29). On the other hand, the methanolysate of permethylated saccharide 2 exhibited two peaks (see Additional file 2) corresponding to methyl 2,3,4,6-tetra-O-methyl-D-glucoside (tR, 0.97 and 1.47). GC-MS analysis on the retention times and fragmentation patterns of the methyl glucosides  showed the two peaks (10.08 min and 10.21 min) from the methanolysate of permethylated saccharide 2 to be methyl 3,6-di-O-methyl-D-glucoside. From these findings above, saccharides 1, 2 and 3 were proved to be, O-D-fructofuranosyl-(2->1)-O-[D-glucopyranosyl-(1->3)]-D-glucopyranoside, O-D-glucopyranosyl-(1->2)-O-[D-glucopyranosyl-(1->4)]-D-glucose and O-D-fructofuranosyl-(2->6)-O-D-glucopyranosyl-(1->3)-D-glucose, respectively. MALDI-TOF-MS spectra of saccharides 1, 2, and 3. 1: saccharide 1, 2: saccharide 2, 3: saccharide 3. The structural confirmations of saccharides 1, 2 and 3 according to 1H and 13C NMR analyses and the subsequent complete assignment of 1H and 13C NMR signals of the three saccharides were carried out using 2D-NMR techniques. 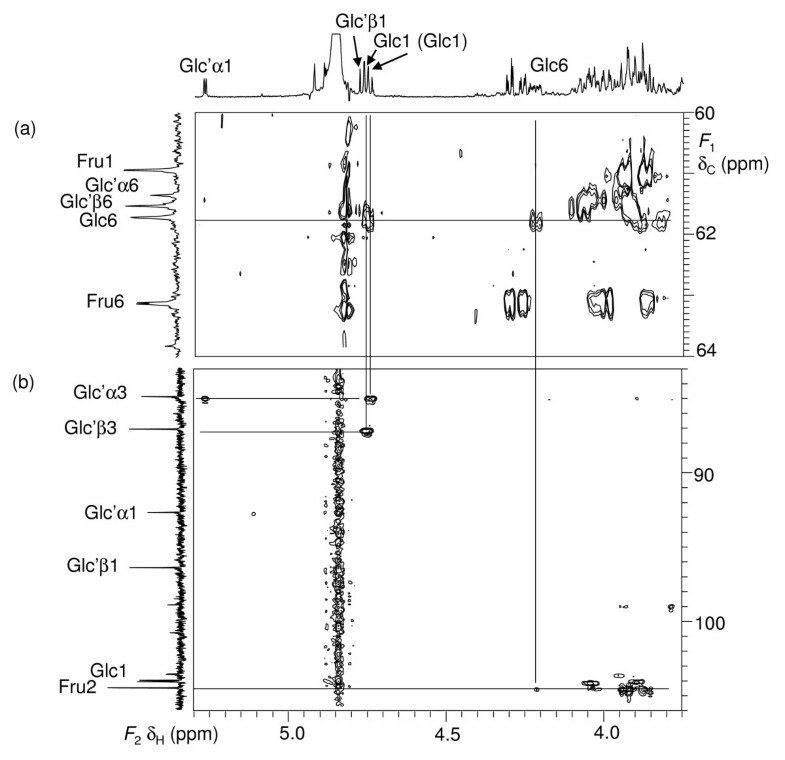 First, the NMR spectra of saccharide 1 were analyzed. The HSQC-TOCSY spectrum revealed the1H and 13C signals of each Glc, Glc' and Fru. The isolated methylene was assigned as H-1 and C-1 in Fru. The other three methylene carbons were assigned as C-6 in these residues. The COSY spectrum assigned the spin systems of these residues; from H-1 to H-3 and H-1' to H-3' (Fig. 3(a)), and from H-3" to H-6". The corresponding 13C signals were assigned by HSQC spectrum (Fig. 3(b)). These results clarified the assignment of 1H and 13C NMR signals of each residue. The position of the glucosidic linkage and fructosidic linkage was analyzed as follows. The C-3' showed the HMBC [13, 14] correlations between H-1 (Fig. 3(c)). The J (H-1/H-2) value was 7.9 Hz. These results indicated the Glc 1β ->3' Glc linkage, namely the laminaribiose moiety. The C-2" showed the HMBC correlations to H-1'. The J (H-1'/H-2') value was 7.4 Hz. These results indicated the Glc' 1β ->2 β Fru linkage, and all 1H and 13C NMR signals were assigned as shown in Additional file 3. Part of COSY (a), HSQC (b) and HMBC (c) spectra of saccharide 1. The coupling patterns of overlapped 1H were analyzed by the SPT method [15, 16]. Due to strong coupling between H-4' and H-5', these couplings could not be analyzed in first order. 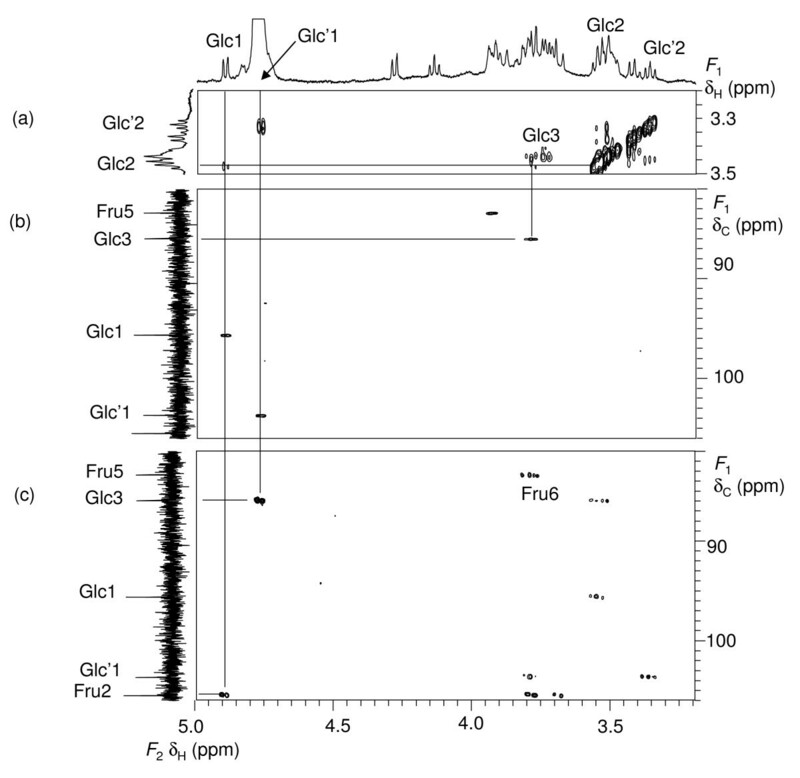 The NMR spectra of saccharide 2 showed that it was an anomeric mixture at the Glc. The α anomer was predominant. The COSY spectrum was assigned from H-1 to H-6. The C-4 showed the HMBC correlations between H-1" (Fig. 4(a) and 4(b)). The J (H-1"/H-2") value was 7.6–7.8 Hz. These results indicated the Glc" 1β ->4 Glc linkage, namely the cellobiose moiety. The C-2 showed the HMBC correlations to H-1'. The J (H-1'/H-2') value was 7.6 Hz. These results indicated the Glc' 1β ->2 Glc linkage, and all 1H and 13C NMR signals were assigned as shown in Additional file 3. Part of HSQC (a) and HMBC (b) spectra of saccharide 2. ( ) = minor anomer. 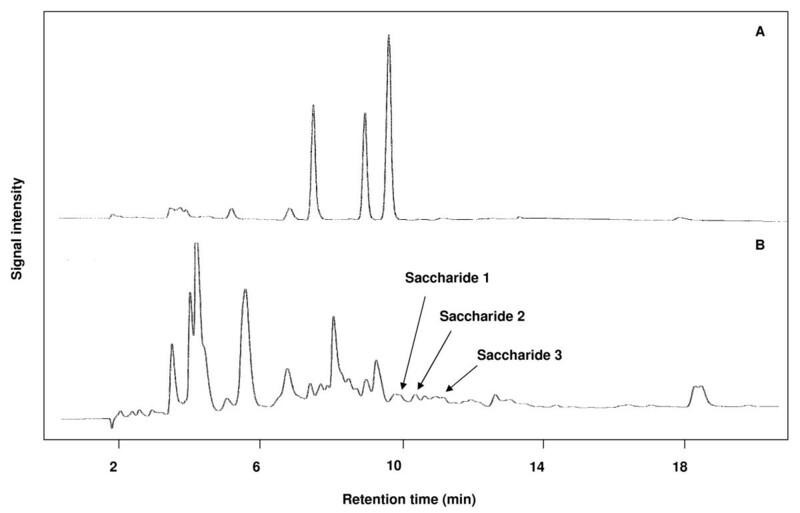 The NMR spectra of saccharide 3 were analyzed in the same manner as those of saccharide 2. Saccharide 3 was also an anomeric mixture at the Glc'. The β anomer was predominant. The HSQC-TOCSY spectrum revealed the1H and 13C signals of each Glc, Glc' and Fru. The isolated methylene was assigned as H-1" and C-1". The other three methylene carbons were assigned as C-6 in these residues (Fig. 5(a)). The position of the glucosidic linkage and fructosidic linkage was analyzed as follows. The C-3' showed the HMBC correlations between H-1 (Fig. 5(b)). The J (H-1/H-2) value was 7.9 Hz. These results indicated the Glc 1β ->3 Glc' linkage, namely the laminaribiose moiety. The C-2 showed the HMBC correlations to H-6. 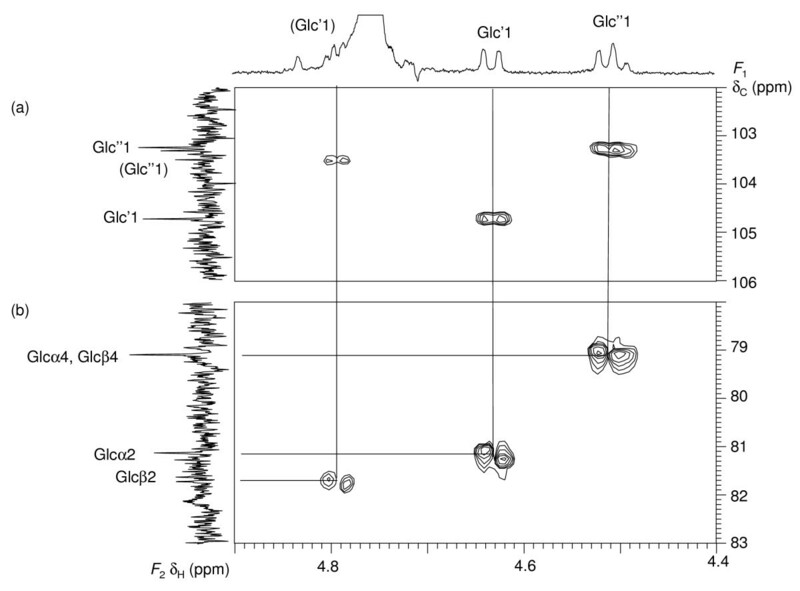 These results indicated the Glc 6 <-2 β Fru linkage, and all 1H and 13C NMR signals were assigned as shown in Additional file 3. Part of HSQC-TOCSY (a) and HMBC (b) spectra of saccharide 3. ( ) = minor anomer. From all of these findings, saccharides 1, 2, and 3 from the fermented beverage of plant extracts were confirmed to be new oligosaccharides (Fig. 1):O-β-D-fructofuranosyl-(2->1)-O-[β-D-glucopyranosyl-(1->3)]-β-D-glucopyranoside (named "3G-β-D-glucopyranosyl β, β-isosucrose"), O-β-D-glucopyranosyl-(1->2)-O-[β-D-glucopyranosyl-(1->4)]-D-glucopyranose (41-β-D-glucopyranosyl sophorose) and O-β-D-fructofuranosyl-(2->6)-O-β-D-glucopyranosyl-(1->3)-D-glucopyranose (62-β-D-fructofuranosyl laminaribiose). Synthesis of the saccharides by fermentation of plant extracts was investigated using HPAEC. Almost all of the monosaccharides were removed from the fermented and unfermented beverages of plant extracts by the batch method with Charcoal. The saccharides 1, 2, and 3 were observed in the fermented beverage, but were not present in the unfermented one. Therefore, saccharides 1, 2, and 3 were confirmed to have been produced during fermentation of the beverage of plant extracts (Fig. 6). High performance liquid chromatogram of fermentation products. A: The beverage of plant extract was fermented for 0 days. B: The beverage of plant extract was fermented for 180 days. The beverage (100 mL) fermented for 0 or 180 days was mixed with charcoal (10 g), stirred for 3 h. and filtered. The charcoal was extracted with 30% ethanol (500 mL) three times. The ethanol extracts were combined, concentrated to dryness and solubilized with one mL of distilled water. The sugar solution was analyzed by HPAEC. We have previously found that the fermented beverage contained the novel saccharide, O-β-D-fructopyranosyl-(2->6)-D-glucopyranose, which is produced by fermentation. The saccharide showed low digestibility. The saccharide was selectively used by beneficial bacteria, Bifidobacterium adolescentis and B. longum, but was not used by unfavorable bacteria, Clostridium perfringens, Escherichia coli and Enterococcus faecalis that produce mutagenic substances . It is interesting to study the biological functions of other oligosaccharides existing in the beverage. In this report, three novel oligosaccharides have been found from this beverage, and isolated from the beverage using carbon-Celite column chromatography and preparative high performance liquid chromatography. Structural confirmation of the saccharides was provided by methylation analysis, MALDI-TOF-MS and NMR measurements. These saccharides were identified as new trisaccharides:O-β-D-fructofuranosyl-(2->1)-O-[β-D-glucopyranosyl-(1->3)]-β-D-glucopyranoside (named "3G-β-D-glucopyranosyl β, β-isosucrose"), O-β-D-glucopyranosyl-(1->2)-O-[β-D-glucopyranosyl-(1->4)]-D-glucopyranose (41-β-D-glucopyranosyl sophorose) and O-β-D-fructofuranosyl-(2->6)-O-β-D-glucopyranosyl-(1->3)-D-glucopyranose (62-β-D-fructofuranosyl laminaribiose). These saccharides were confirmed to be produced during fermentation. For preparation of the initial juice, 50 kinds of fruits and vegetables were used to produce the final extract as shown in a previous paper [1, 2]. The 50 fruits and vegetables were cut, sliced or diced into small pieces, mixed and put in cedar barrels. Afterwards, an equivalent weight of sucrose was added to the samples, mixed well to allow high contact between the samples and sucrose, and then the barrels were left for one week at room temperature. The juice exudate was then separated without compression from solids and used for fermentation. The fermented beverage was obtained by incubation of the juice at 37°C in the dark by natural fermentation using yeast (Zygosaccharomyces spp. and Pichia spp.) and lactic acid bacteria (Leuconostoc spp.). After 7 days, the fermented beverage was kept in a closed enameled tank at 37°C for 180 days for additional maturation and ageing, finally obtaining a brown and slightly sticky liquid. The oligosaccharides were analyzed using a Dionex Bio LC Series apparatus equipped with an HPLC carbohydrate column (Carbo Pack PA1, inert styrene divinyl benzene polymer) and pulsed amperometric detection (PAD) [17, 18]. The mobile phase consisted of eluent A (150 mM NaOH) and eluent B (500 mM sodium acetate in 150 mM NaOH) with a sodium acetate gradient as follows: 0–1 min, 25 mM; 1–2 min, 25–50 mM; 2–20 min, 50–200 mM; 20–22 min, 500 mM; 22–30 min, 25 mM; using a flow rate through the column of 1.0 mL/min. The applied PAD potentials for E1 (500 ms), E2 (100 ms), and E3 (50 ms) were 0.1, 0.6, and -0.6 V respectively, and the output range was 1 μC. The fermented beverage of plant extracts (1000 g) was loaded onto a carbon-Celite [1:1; charcoal (Wako Pure Chemical Industries, Ltd; Osaka, Japan) and Celite-535 (Nacalai Tesque Inc, Osaka, Japan)] column (4.5 × 35 cm), and was successively eluted with water (14 L), 5% ethanol (30 L) and 30% ethanol (10 L). Almost all of the glucose and fructose were eluted with water (4 L), and then saccharides 1, 2 and 3 were eluted with 30% ethanol (1–2 L). The 30% ethanol fraction containing saccharides 1, 2 and 3 was concentrated in vacuo and freeze-dried to give 894 mg of sample. Subsequently, the 30% ethanol fraction was successfully repeatedly purified using an HPLC system (Tosoh, Tokyo, Japan) equipped with an Amide-80 column (7.8 mm × 30 cm, Tosoh, Tokyo, Japan) at 80°C, and eluted with 80% acetonitrile at 2.0 mL/min, and using refractive index detection. Furthermore, the saccharides were purified by HPLC with the ODS-100 V column (4.6 mm × 25 cm, Tosoh, Tokyo, Japan) at room temperature, and eluted with water at 0.5 mL/min. Purified saccharides 1 (2.5 mg), 2 (2.2 mg) and 3 (2.0 mg) were obtained as white powders. Methylation of the oligosaccharides was carried out by the method of Hakomori . The permethylated saccharides were methanolyzed by heating with 1.5% methanolic hydrochloric acid at 96°C for 10 or 180 min. The reaction mixture was treated with Amberlite IRA-410 (OH-) to remove hydrochloric acid, and evaporated in vacuo to dryness. The resulting methanolysate was dissolved in a small volume of methanol and analyzed using gas liquid chromatography. For the analysis of the methanolysate, GLC was carried out using a Shimadzu GC-8A gas chromatograph equipped with a glass column (2.6 mm × 2 m) packed with 15% butane 1,4-diol succinate polyester on acid-washed Celite at 175°C. Flow rate of the nitrogen gas carrier was 40 mL/min. GC-MS analysis was performed using a JMS-AX500 mass spectrometer (JEOL, Japan) using a DB-17HT capillary column (30 m × 0.25 mm I.D., J & W Scientific, USA). Injection temperature was 200°C. The column temperature was kept at 50°C for 2 min after sample injection, increased to 150°C at 50°C/min, kept at 150°C for 1 min, and then increased to 250°C at 4°C/min. The mass spectra were recorded in the electron ionization (EI) mode. MALDI-TOF-MS spectra were measured using a Shimadzu-Kratos mass spectrometer (KOMPACT Probe) in positive ion mode with 2.5%-dihydroxybenzoic acid as a matrix. Ions were formed by a pulsed UV laser beam (nitrogen laser, 337 nm). Calibration was done using 1-kestose as an external standard. The saccharide (ca. 2 mg) was dissolved in 0.06 mL (saccharide 1) and 0.4 mL (saccharide 2 and 3) D2O. NMR spectra were recorded at 27°C with a Bruker AMX 500 spectrometer (1 H 500 MHz, 13C 125 MHz) equipped with a 2.5 mm C/H dual probe (saccharide 1), a 5 mm diameter C/H dual probe (1D spectra of saccharide 2 and 3), and a 5 mm diameter TXI probe (2D spectra of saccharide 2 and 3). Chemical shifts of 1H (δH) and 13C (δC) in ppm were determined relative to an external standard of sodium [2, 2, 3, 3-2H4]-3-(trimethylsilyl)-propanoate in D2O (δH 0.00 ppm) and 1, 4-dioxane (δC 67.40 ppm) in D2O, respectively. 1H-1H COSY [20, 21], HSQC , HSQC-TOCSY [22, 23] CH2-selected E-HSQC-TOCSY , HMBC [13, 14] and CT-HMBC [13, 14] spectra were obtained using gradient selected pulse sequences. The TOCSY mixing time (0.15 s) was composed of DIPSI-2 composite pulses. HO, AY and NK performed data analysis, and contributed to drafting the manuscript. EF and JK collected the NMR data. NS and SO conceived of the study, participated in its design and contributed to drafting the manuscript. All authors read and approved the final manuscript.